At least two potential Democratic candidates are already pondering a 2020 bid for the late John McCain's Senate seat. Grant Woods, the former Arizona attorney general and former chief of staff to McCain, says the death of his longtime friend has him eyeing his former boss's seat. And Rep. Ruben Gallego, D-Arizona, tells CBS News that he is thinking about a campaign but won't make a decision until after November's elections. "Yes. Confirmed," Woods said in a statement to CBS News early Thursday in response to reports he's considering a bid. He also told Capitol Media Services that the passing of McCain forced him to reflect on the absence the late senator leaves behind as one of the more outspoken members of Congress in an era of deep political discord. "The country, I think, is really in a chaotic, difficult place," Woods told the outlet. "So I have to do some real soul searching and just make a decision here." Woods later told the Washington Post that over the week-long events honoring McCain it was difficult to think of "staying on the sidelines as we face a world without John McCain." Woods noted, however, that running as a Republican wasn't a "realistic possibility" despite winning two Republican primaries for the state's attorney general. "Things have changed," he said. "I haven't changed but the party has changed...if it wants to be the party of Trump, that's not me." Aides to Senate Minority Leader Chuck Schumer, D-New york, declined to comment on Woods. Schumer as party leader is always actively involved in recruiting potential Democratic Senate candidates. He encouraged Rep. Kyrsten Sinema, D-Arizona, to launch her campaign to succeed retiring Sen. Jeff Flake, R-Arizona, and helped nudge out other potential contenders to make way for Sinema. Woods has also spoken with Sen. Heidi Heitkamp,D-North Dakota, about a potential run. The senator confirmed her conversations with Woods in a statement, saying that "Grant is a centrist, a dear friend, and someone I worked very closely with when we were both state attorneys general working to combat domestic violence and on habeas corpus. The Senate needs more public servants like him who want to get things done and who are willing to work with anyone to make that possible." Gallego, who represents a district encompassing much of Phoenix, said he will make up his mind about a potential Senate bid after winning re-election to his House seat. "We are focusing on this November's elections," he said in a text message. "After the election I will get together with my family, friends and supporters to explore running." Gallego, 38, is a former Marine Corporal who served in the Iraq War and has emerged as a strident critic of President Trump, especially on national security and immigration issues. He openly toyed with running for Flake's seat this year but took a pass in part he said because he is eager to help raise his young infant son. Woods also told Capitol Media Services that he would make a final decision after the first of the year. 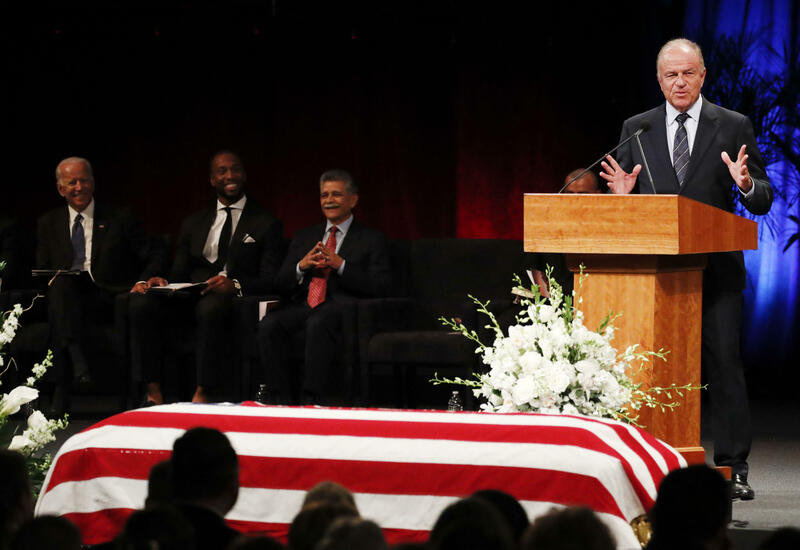 Woods's eulogy at McCain's funeral drew immediate support from both sides of the aisle for his honest and humorous reflection on the longtime Arizona senator. Invoking the spirit of McCain, Woods urged those assembled at the late senator's funeral to strive for the level of bipartisanship that McCain was known for. "I hope that what he stood for will maybe get renewed look in our country, that's what he would want. He believed so much that this in the end when it's all said and done that this Republican and Democrat thing is not that important is it. We're all Americans and you got to get to the point where we can work together as Americans," said Woods. For now, McCain's seat is currently filled by another longtime McCain friend, former Sen. Jon Kyl, who was sworn in at the Capitol by Vice President Mike Pence on Wednesday. Arizona Governor Doug Ducey on Tuesday tapped him to take over McCain's vacant seat until the 2020 election. Another election will be held to fill the remaining two years of McCain's six-year term after that. Ducey said he hasn't received an assurance from Kyl that he will serve through 2020, but Kyl has agreed to serve at least through the current term in Congress. He said he doesn't intend to run for the seat in the future, or for any other seat.